Imagine, if you will, Nicolas Cage as your father. And imagine that this Nicolas Cage, who is your father, is in full nutso freakout mode, exactly the Nicolas Cage we love to watch so much in all of his worst movies. Except, he wants to kill you. It'd be kinda awesome, kinda funny, kinda surreal, but also kinda scary. And all of those things are what you get out of Mom and Dad, a suburban dark comedy that explores middle class/middle age angst with the kind of hysterical mania you'd expect from the pairing of Cage and Brian Taylor, the director of Crank. Taylor, working on his own for the first time, still has the same twisted sense of humor, and working alongsidea fully heightened Cage it makes for a master class in depravity. I mean, the entire movie is about parents killing their kids...and finds humor in it. Some may find that too disturbing to endure but for me, and I don't know what that says about me exactly, it was loads of fun. Cage and a terrific Selma Blair are bored married couple Brent and Kendall Ryan. Theyre both disappointed in how their lives have turned out. She takes pilates to try and maintain her youth while he has a dead-end job he hates and a living room full of toys that he's constantly tripping on, thanks to his precocious 10-year-old son Josh (Zackary Arthur). Meanwhile, they also have a rebellious teeenaged daughter, Carly (Anne Winters) who hates her parents and steals money and is basically everything every parent would hate about a kid that age. Doesn't Carly understand that her parents are people, too? That they were once her age? Well, she'll come to learn the same harsh lessons as kids the world over do, when suddenly a wave of parental violence hits the country. Eerily, dozens of adults waiting outside the high school doors for their children to be let out of school, only for panic to strike when those parents start slaughtering their young. If you've seen Taylor'r prior movies then you blistering wall-to-wall action to follow. There's barely an explanation for the pandemic, if that's what you'd call it, but something has reversed the protective instinct in parents and turned them into murderers. Taylor introduces this madness on a wide level as a means of shock; news reports flooding in of the killings only increasing the panic across the globe. But the film really cranks (pun intended) into high velocity as he narrows the field of focus to the Ryan's neighborhood, as the family housekeeper slaughters her daughter mercilessly and other friends of the family go unhinged. 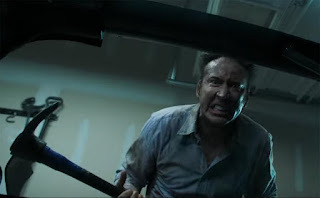 We keep waiting for Cage to go off the rails, trained to expect him to always be somewhat deranged, but Brent's flip-out moment is teased wonderfully until just the right time. And soon it's kids vs. parents in a multigenerational bloodfeud that turns common household items into deadly weapons of war. "It's a Saws All, means it saws all...", Kendall eerily informs her complicit hubby as they stalk the kiddos. Beautifully cut within the madness are flashbacks to times that are sometimes happy, sometimes clues to the adult angst that maybe (?) sparked this insanity. One of its most brilliant moments actually comes before the outbreak, as Brent, fully in midlife crisis mode, buys a pool table as part of a new man cave he wants to build. Only to destroy it in a rage, sledgehammer in hand, as Kendall tears him down for being so obvious. They then quietly sit and come to grips with their unhappiness at how lame being adult parents can be. Fast forward to the two of them trying to gut their children like fish. This is a movie that was tailor made for Cage. We've come to expect a high level of lunacy from him but it's hard wired into every fabric of this movie. I couldn't imagine Mom and Dad without Cage, but I don't want to overlook Blair's part in this. She's fantastic, too, as the earnest and eager Kendall, who is as sweet as can be when she's not trying to gas her children to death. Because the parents are basically their normal selves when not in a murderous rage, her transformations are the most jarring and disturbing, and Blair handles the emotional shifts wonderfully. Everyone, including Winters as the film's focal point, acclimate themselves to Taylor's wild extremes in tone and editing. Taylor's frenetic, unpredictable style is what makes this film click, only failing him in the sudden, unsatisfying conclusion that just comes out of nowhere and snaps you out of the 80-minute long sugar high you've been riding. Intergenerational resentment certainly isn't going to go away; the previous generation will always demonize the current one while holding themselves up as superior. Maybe Mom and Dad has it right; let all sides fight it out to see whose best. My gut tells me the side with Nicolas Cage wins.